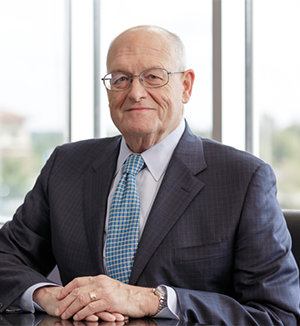 Joe Owen began practicing law in 1976 after receiving his J.D. from the University of Virginia Law School. He is an experienced and well-respected trial lawyer who has achieved large jury verdicts and settlements in civil cases and excellent results for clients in criminal cases. Joe received a B.S. degree from the University of Richmond in 1972, where he was a four year scholarship football player. Joe’s early athletic experience continues to impact his life. He spent 20 years as a volunteer, coaching youth sports. Joe’s greatest and fondest accomplishment in sports is teaching and coaching his three sons, Elliott, Grayson and Reid. All three played football in school. He is a former State Chairman for the Fellowship of Christian (FCA) Athletes and served on its National board of Trustees for twelve years. Joe and his wife Lori, a retired kindergarten teacher, reside in Midlothian. Two of his sons, Elliott and Reid, live in Los Angeles; Joe’s middle son, Grayson, is deceased. Joe’s community involvement includes being a Charter Member as well as past president of the Midlothian, VA Rotary Club. He is also a founding member of North Star Community, which provides a Christ- centered approach to recovery where hurting people and families can receive encouragement, education and support in their recovery process. He is currently the Chairman of the Drug Court Foundation of Chesterfield County. The Drug Court offers people with drug addictions that have been charged with a drug or larceny offense an opportunity to get intensive addiction recovery treatment and have their charges dismissed. Joe is passionate about his work in addiction recovery and equally passionate about helping his clients restore and recover their lives during often difficult situations that have put them in the legal system. He, and his partners, founded Owen & Owens PLC with a different focus than many law firms; Joe is interested in people. Specifically in helping people, for Joe, “Every Client Matters” is not just a firm tagline; it’s his personal mantra in practicing law.